Do you need a Serbian visa or passport? If you do, you may need to find an experienced professional in London who can help you with obtaining your Serbian passport photo or visa photo. At Reload Internet, we can help you get these pictures taken by a knowledgeable staff member who will provide you with a set of photographs that meet all of the necessary criteria stated by the Serbian government. You do not need any appointment to get your Serbian passport photo or visa photo taken by us, just visit our store and the process only takes around 10 minutes to complete. We are located in Paddington, London, on the same street as both Paddington Train and Tube stations, and are open 7 days a week from early in the morning until late in the evening. This makes us the most accessible, convenient and reliable passport photo studio in London for you to have your Serbian passport photo or visa photo captured, printed and prepared at! You must ensure that the photographs you submit with your passport or visa application to the Embassy of Serbia are of high quality and meet all of the necessary requirements. If they don’t, then you may encounter delays, which could affect your travel plans. Come to Reload Internet to ensure that this won’t happen, we take hundreds of passport photos every week and guarantee that the Serbian passport photo or visa photo you receive from us will pass at the Embassy of Serbia! It is important that the photo that you submit is in color and has been taken recently (some point within the past 6 months) as they require a picture with recent likeness. You will need to submit 3 identical photos that are measured 45mm x 35 mm, with a light colored background. When the picture is taken, the photo needs to be a full-face image, with you looking directly into the camera. Any profile pictures will immediately be rejected. You are not able to wear any scarves or hats in your picture. Officials will not accept any instant photos. You need to be sure that you have a neutral expression on your face, one where you do not show your teeth, smile or frown. Your eyes need to be open, without squinting or raised eyebrows. This is a rule that applied to both adults and infants. You are only able to wear clothing that you would wear on a regular basis, not any uniform unless you wear religious, military, etc. attire every day. You can wear glasses and hearing aids in your photo if you also wear them on a regular basis, however you cannot wear sunglasses or tinted eyeglasses in the photo. Even so, we recommend removing your glasses to ensure that the photograph will pass. A lot of the requirements for the Serbia visa are the same as what is required for a Serbia passport. You will only need 1 photograph for your visa, which should be sized 45mm x 35mm. The background for this photo must be either white or off-white in color and cannot be patterned. These images must be recent (also within 6 months) and needs to be in color. The photo should only have an up-close image of your face from the shoulders up otherwise the images will likely be rejected by officials. Your face cannot be obstructed by your glasses or your headwear in any way, including if they merely cast a shadow on your face. 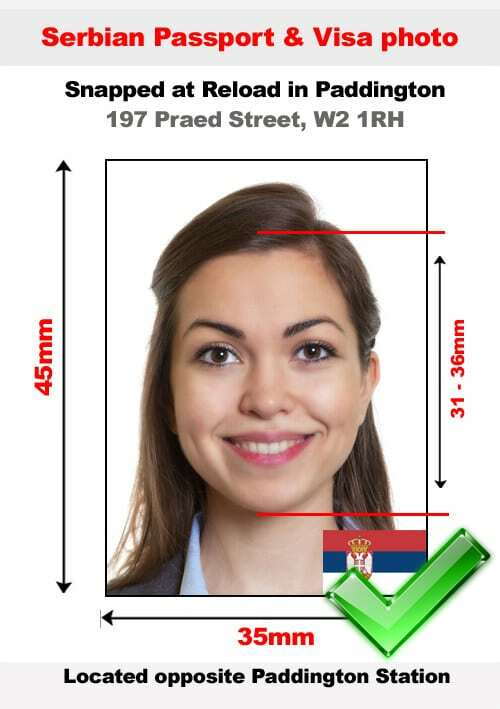 We guarantee that if your have your Serbian passport photo or visa photo taken at Reload Internet, it will pass first time with your application. We receive all of our specifications directly from the official Embassy of Serbia’s guidelines on passport and visa photographs, which can be found here.